We must all take care to make sure our greens are not damaged in the course of play. We are all aware of the damage caused by birds but some of the damage is cause by players. Pitch marks that have been left not repaired, carelessness in handling the pin and removing the ball from the cup with a putter are the principal causes of damage. Please do not use a putter to remove the ball from the hole. Q. Our group reaches the putting green, and we`ve noticed the hole is damaged. What should we do? A. 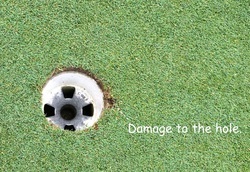 If the damage is a ball mark, you may repair it. (Rule 16-1c). 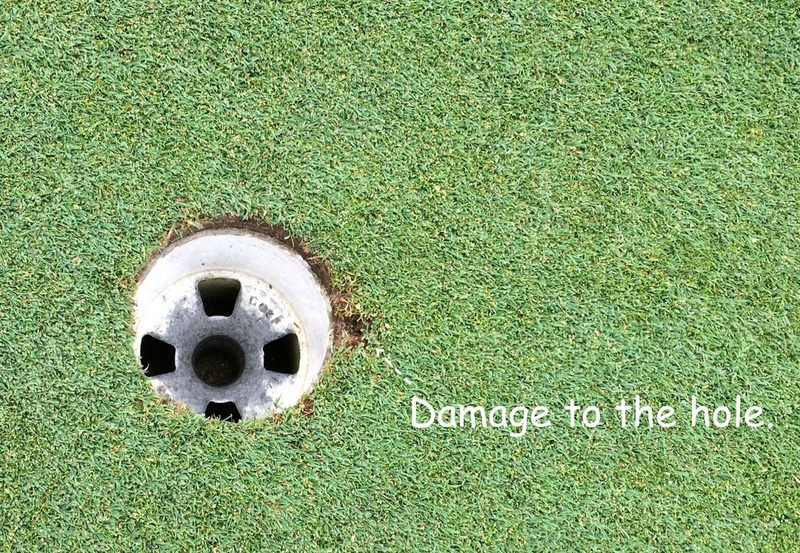 However, if the damage is something other than the ball mark, the answer depends on the extent of the damage. A hole that is damaged, but the dimensions of the hole have not been materially changed, must not be touched, and you must continue play of the hole. If the hole is damaged materially, a member of the Committee should be requested to repair the damage. In this case, you may only repair the hole if a Committee member is not readily available. Repairing the hole when not permitted will result in a breach of Rule 16-1a for touching the line of putt. 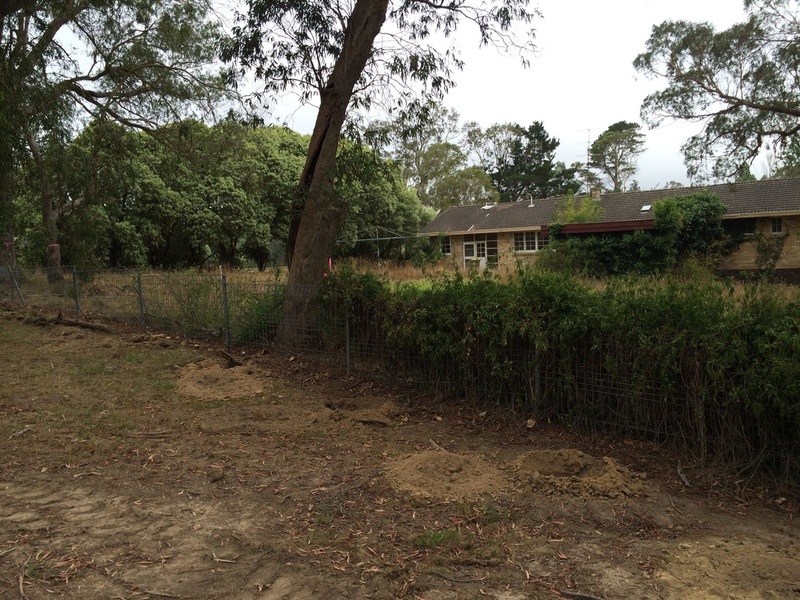 The land behind the 25th tee has been cleared and is to be developed. Kevin Kenny and i have had a meeting with the developer who told us of his plans for the development. He said that there would be 29 residences within the development and that it would be along the lines of the development Rosevale on the Moss Vale Rd . This is all conditional on a development application, that is yet to be lodged, being approved by WSC. Our ground staff have been planting Photinia Robusta around the boundary of the development to provide a screening of the residences from the golf course. Plantings have been completed on the north-west boundary (except behind the 15th tee) and are continuing down the south-west boundary. 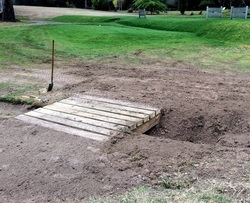 Our ground staff have installed a new bridge off the 16th. We can all remember last winter when the path from the 16th green to the 17th became impassable and we had to go via the bridge off the western side of the green. The new bridge is modelled after the 'sleeper' bridge on the 3rd. It is constructed from H4 pine sleepers (H4 is a grade of treated timber suitable for in-ground use). The top of the bridge will be covered with wire netting to provide a secure foothold when it is wet. Grass will be grown around the bridge and the high wear areas leading to and from the bridge will be crushed stone. The second day of stump grinding is today. It is hoped that most, if not all, stumps will be done today. 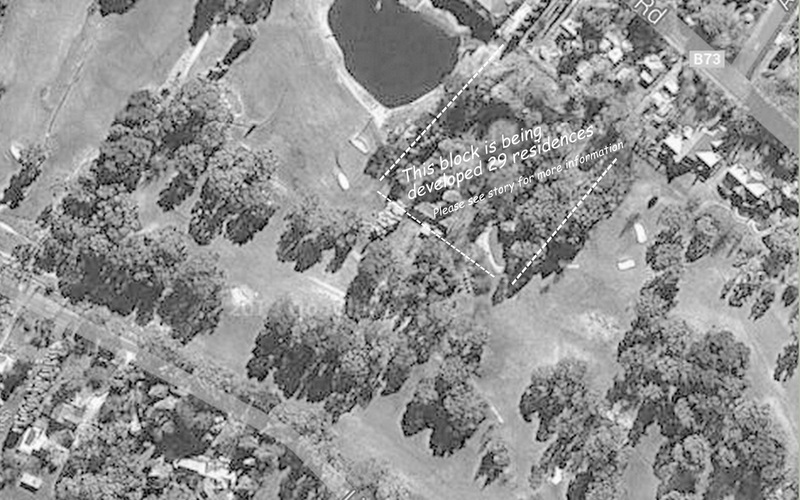 The map of the course to the right shows the locations of the stumps to be removed. Waterlillys have been placed in the 13th pond by Dennis Cooper. The placement of them was in collaboration with the Course Superintendent, Damian Gair. Dennis has a lot of expertise in the growing and propagating of water lillys and has made an arrangement in the 13th pond that over the coming years will be a fantastic display. The pond is also used as a sediment trap (please see the piece on Ephemeral Waterways - click here) so we will have to be careful when we are working there to maintain the depth. The contributions of all volunteers is a feature of our club spirt. The lillys at this stage are in pots but as time goes on it is intended to plant them directly in the soil. The growing and flowering season is coming to an end with another few weeks remaining for the lillies to put on a show. Next year in summer the cycle begins again. 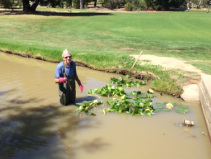 The photo shows Dennis planting the yellow lillies near the 13th pond bridge. The area to the right of the ladies tee on the 14th has, over the years, accumulated quite an amount of soil, soil mixed with tree roots as well as dredgings from cleaning out the ponds on the course of accumulated sediment. This is now in the process of being cleaned up and relocated to an area behind the 9th tee. Clicking through the images shows the progress of this work. 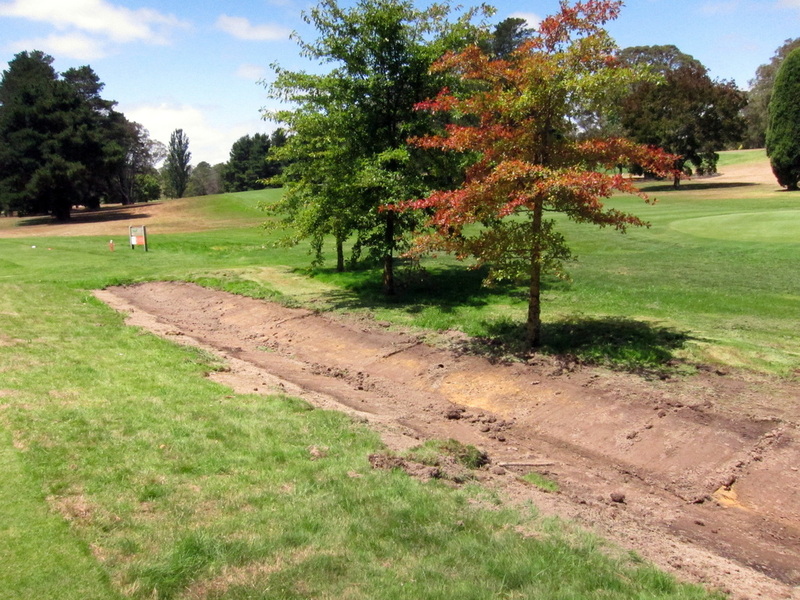 The area around the new second tee was collecting water from the irrigation and threatening the trees. This week a spoon drain was cut to drain into the existing hazard behind the tee. The addition of the drain has been successful in drying out the area. 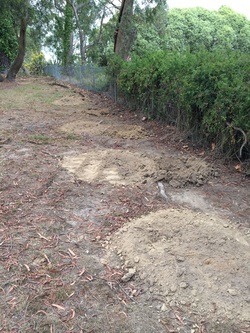 On Thursday a program of stump grinding was commenced sponsored by 2 generous members. Over the years as tree fall down or are removed because of safety issues etc we get left with unsightly stumps. Mowing around them also is a problem. There are over 40 stumps around the course. Stumps in the rough are being ground down so that the mower can pass over them and over time vegetation cover will be established. Where we want good grass cover then stumps are being ground about 100mm below ground level. The stump grinder, for those interested is powered by a 30 hp turbo diesel and is remote controlled. The head has several disks with tungsten carbide teeth. The teeth can be rotated so a new surface can be exposed to do the cutting. After a day of grinding the teeth are rotated 120 degs. The new teeth cost $20 each. New 100 and 150 metre distance posts have been purchased this year. These will be installed over the new weeks. They will stand out of the ground about 900mm. While members may be very familiar with the distance to the pin at various points around the course visitors to our course have not the same familiarity. A replacement head-wall will stop this happening and as a consequence stop holes developing in the surface of the bridge. Various options were looked at to repair the bridge before this course of action was decided on. Warwick Keirnan is looking at the design of the head-wall and other natters to do with the modification and repair. On the golf course we have a waterway running from the dam area through the course until it runs off the course at the 18th. 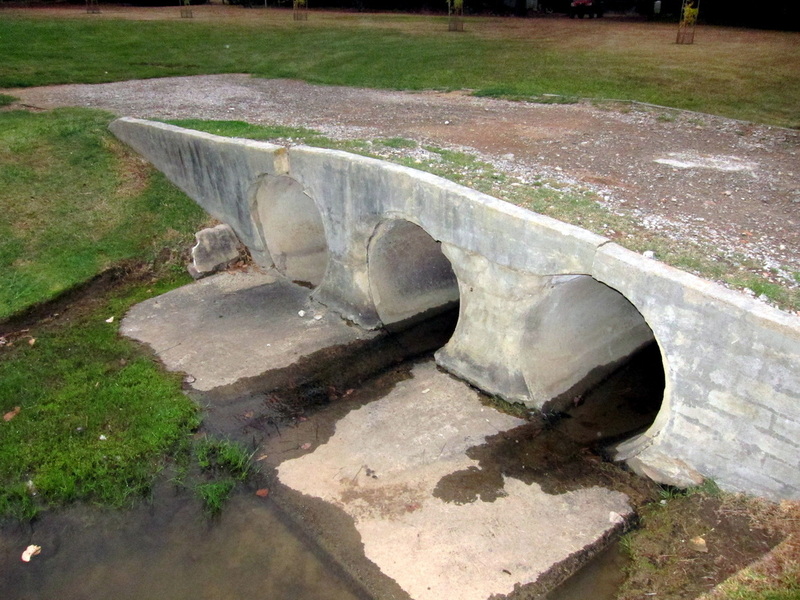 The waterway drains from the front of the Majors and also storm water comes from Kangaloon Road and Bowral House. 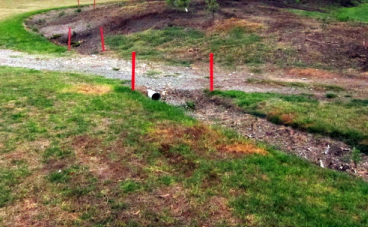 If the water is left to trickle through open channels, the channels gradually silt up and become muddy hazards. These muddy channels must be cleaned out from time to time so that the water flows away and doesn't form a series of pools. This is a continual maintenance cost with clean outs costing around $3000 or so per year. As well as this for golfers they form a hazard - that's part of the game. 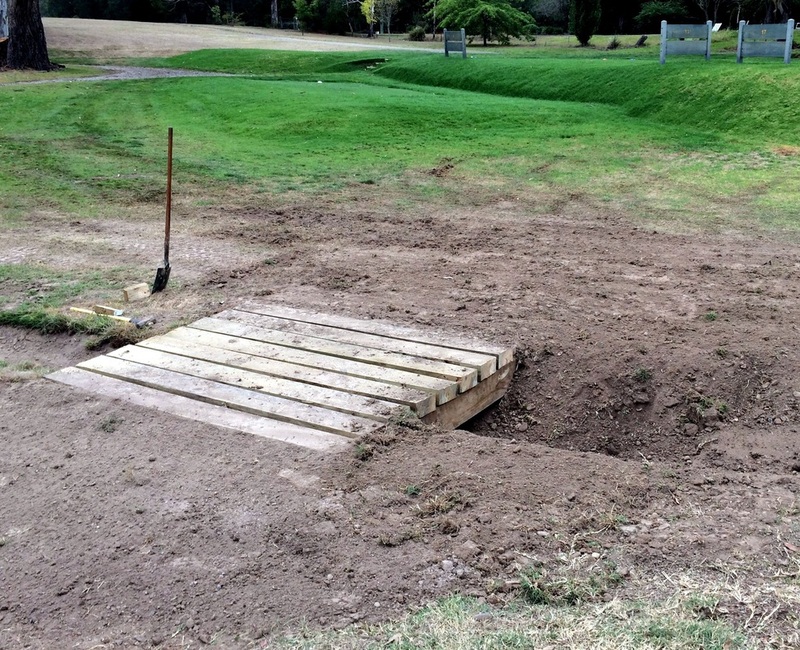 Some golfers have an ability to find hazards more than the norm. We have two areas on the golf course that turf can be cut from. 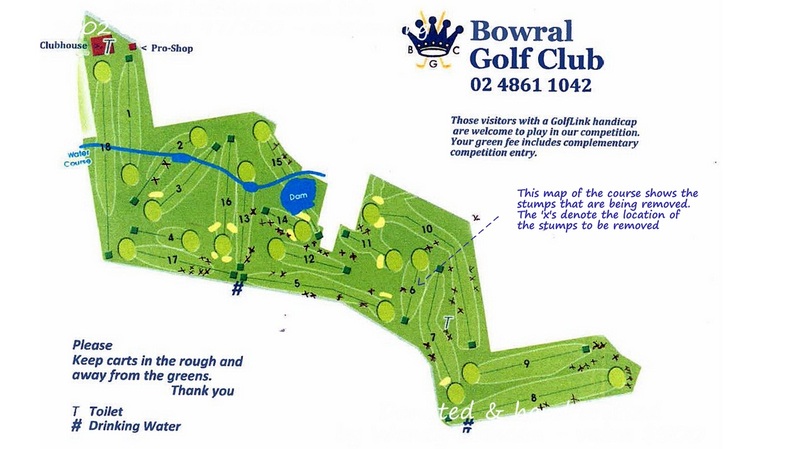 One area is between the 10th and 11th hole and another near the green-keepers sheds. Turf is used to cover areas where recent improvements have been made or other earthworks have taken place. Rather than using turf another option is growing the grass from seed but sometimes a quicker result is required. Buying turf costs around $10 per square metre. 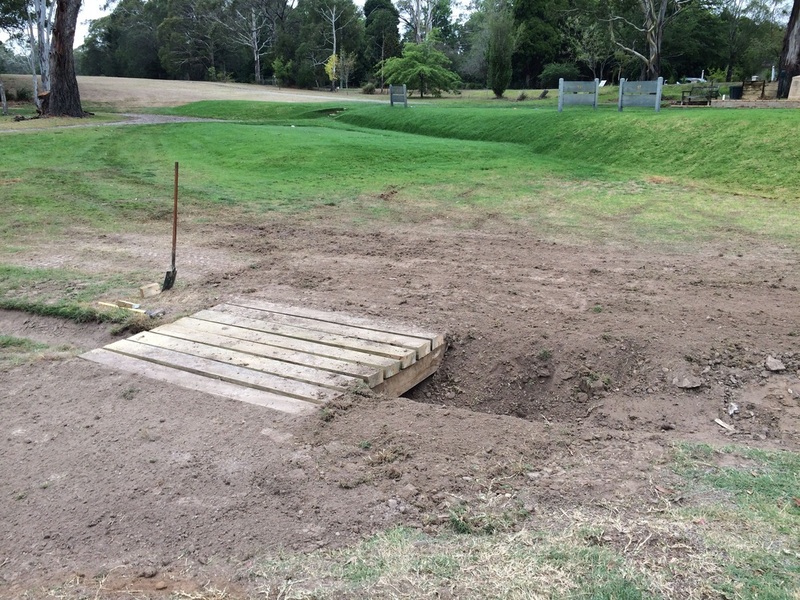 The new men's second tee would have cost well over $3000 if turf had been purchased - not an option. The new 'sleeper' bridge on the 16th. It will have wire netting attached to the top. Why are the sprinklers on ?